Inline, dance, roller derby, speed skates… there are different styles of skates for every type of skating activity. So, how do you choose the right style for you? At Skate Moore in Oklahoma City, we know a thing or two about gear and we want to help you find the perfect skates for your needs. Check out some of the options we stock in our pro shop below! Speed Skates: Meant for going fast as the name implies, speed skates are perfect for racing and speed demons alike. Fitness Skates: This style come in a high top and is the common, recreational style of roller blade. Hockey Skates: This hearty style is made to go fast but also take a beating making them the perfect choice for hockey players. Outdoor Skates: These skates have a softer wheel and lace-up high tops to handle the uneven terrain of outdoor skating. Recreational Skates: When you come in to Skate World and rent skates, this is what you get. These are great all-arounds for indoor recreational use. 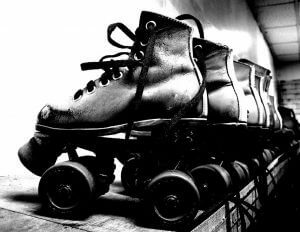 Roller Derby Skates: This style is low top for maneuverability, they have a softer wheel for extra grip and are built to hold up to heavy use. Our team here at the Skate Moore Pro Shop can answer any of your questions. Stop by during our open skating hours and take a couple different styles out for a spin to see what feels right! We’ll be more than happy to help you fine tune your skates for a perfect fit and the perfect glide. If you want to know more, give us a call today at (405) 794-4644.